Victoria Gutierrez on her third day with the Camarillo 22 fire crew. 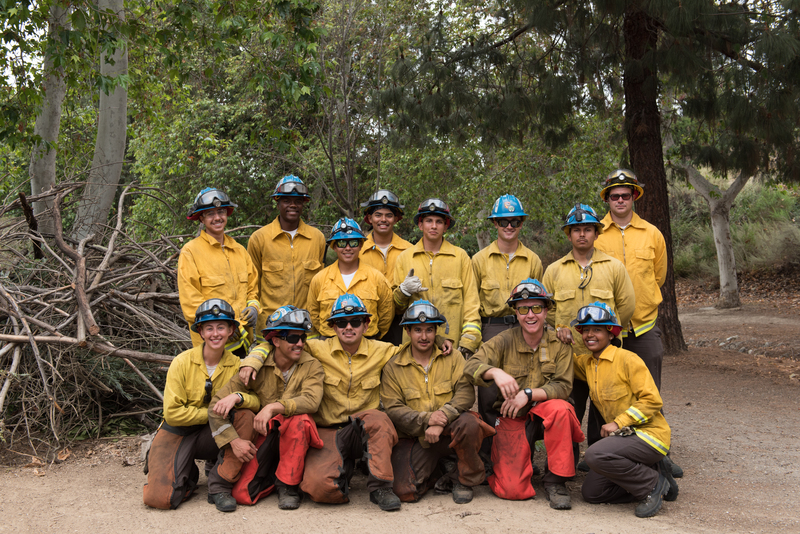 Grant Perkins (left), Conservation Corps supervisor, with some members of the Camarillo 22 fire crew. Corpmembers assess the dried brush in the hills of Camarillo. Corpmembers work as a team to clear cut logs. Corpmembers use chainsaws to cut trees and logs. Gov. Jerry Brown created the California Conservation Corps in 1976. Adam is one of two dozen corpmembers from the California Conservation Corps’ Camarillo Center who worked alongside fire agencies to help stop the Airline Fire. For the past several months, she has been training with the Corps’ wildland firefighting crews to one day become a full-time firefighter. Created in 1976 by Gov. 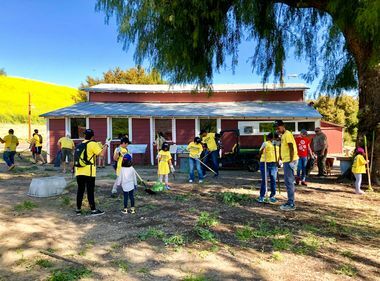 Jerry Brown, the nation’s largest and oldest Conservation Corps has been developing young adults between the ages of 18 and 25 in environmental projects and natural disaster response. 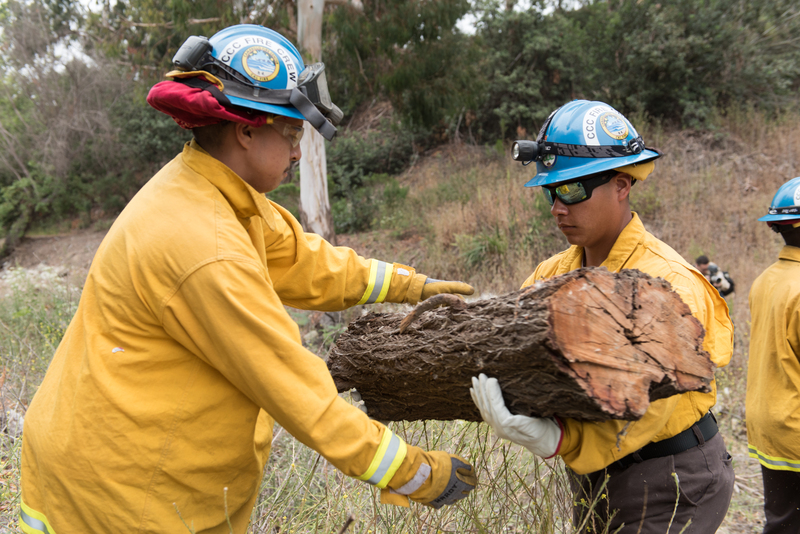 The Camarillo Center is the only residential program in Southern California and its wildland firefighting program has a long waiting list of eager trainees. 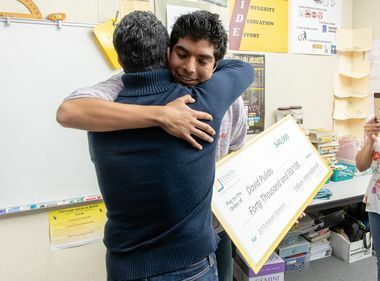 Edison International has been a longtime partner with the Corps’ nonprofit foundation. Recently, Edison provided a $100,000 grant in support of the nonprofit’s wildland firefighting program and its wildfire mitigation measures. 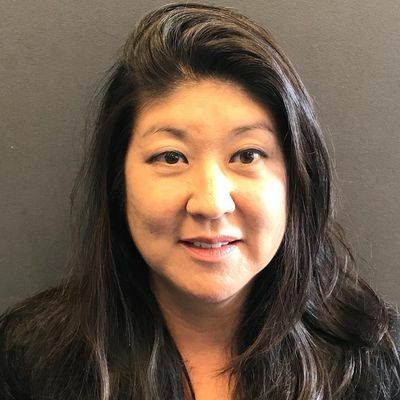 “Edison International will continue to partner with nonprofits around solutions that will make California more resilient against the impacts of natural disasters,” said Janet Clayton, senior vice president of Corporate Communications for Edison International and Southern California Edison. Miles Bontenbal, 20, is the crew boss today as 16 corpmembers train on various wildfire mitigation efforts in the dried brush hills at Santa Rosa and Mission Oaks Road in Camarillo. In addition to brush clearance and removal, the team is working to create a buffer zone which helps to slow down an active fire. Corpmembers (l-r) Victoria Gutierrez, Paige Adam and Miles Bontenbal. As the young men and women use hedgers and chainsaws to cut trees and logs, they clear the area of any dried brush, potential fuel for fires. Earlier in the morning, the group held a tailgate to discuss the morning’s work, use of safety equipment and any potential hazards. 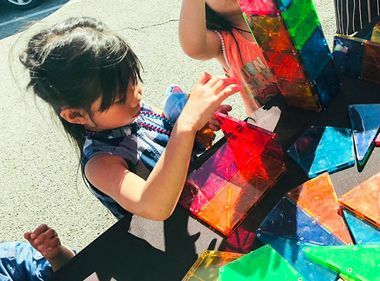 “I love being outside doing this kind of work. I can’t sit at a desk,” said Bontenbal, who joined the Corps in October 2016 and was recently promoted as a crew boss. So far, he has worked with various fire agencies on 15 wildland fires. 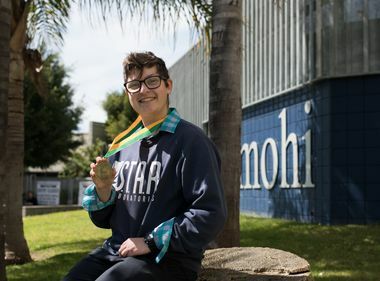 “The integrity side … bringing the fullest out of myself” is what attracted the San Luis Obispo native to the Corps with the hope of one day becoming a firefighter. “It’s not just a job, it’s a lifestyle,” he said. As California’s wildfires occur year-round and become the “new normal,” the demand for the Corps’ fire crews is increasing. In the past year, the crews have worked more than 40 wildfires, often in difficult to access areas. Currently, the Camarillo Center alone has 38 firefighting corpmembers who can be activated during a fire response. 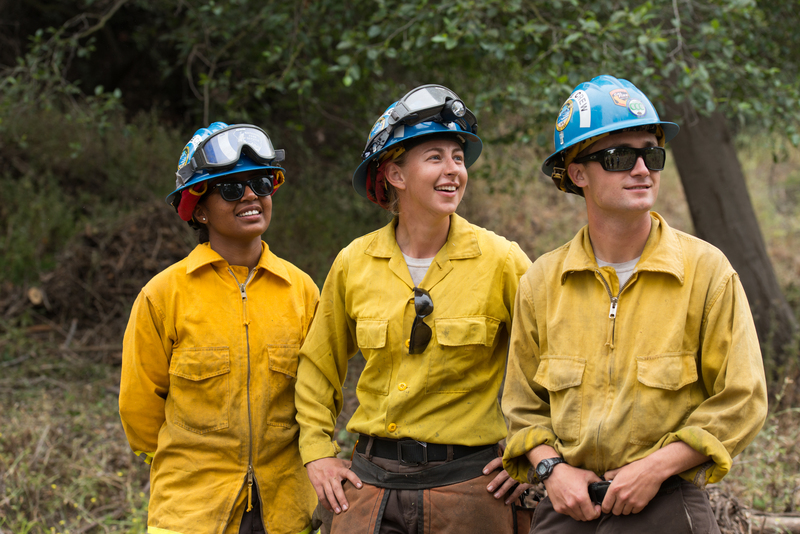 California Conservation Corps wildland firefighting corpmembers. Grant Perkins, 27, Conservation Corps supervisor, who has been on 20 wildland fire responses, recalls one fire where he was doing structural protection work. The crew was able to cut the fire line and help stop the fire from jumping 20 yards from one of the homes. “That was one of the more rewarding times, helping to protect homes,” he said. Today is 24-year-old Victoria Gutierrez’ third day with the Camarillo 22 fire crew. She joined the Corps seven months ago to gain structure and direction in her life. Now, her goal is to become a firefighter.